Bisher sind noch keine Turnierergebnisse von Altairs hinterlegt. For sale 6 year old gelding. The horse was born and raised on my farm. Well-fed, regular intake of vitamins and micronutrients. Regularly groomed nails and teeth floated. Calm, hard working and not lazy, active and sensitive. A benign and smart but very dominant horse. Learns quickly and wants to work with people. Comes to a workout by himself. Spends a lot of time living outside in the wild. 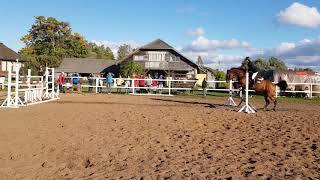 Good trot and good jumping technique, good origin, pleasent, no exterior defects, good X-rays of the legs. No behavioral or health problems. In my opinion, is a prospect both in show jumping and dressage. Aroma's grandson. Aromas children have proved themselves in both of these disciplines. Du möchtest mehr über Altairs erfahren?